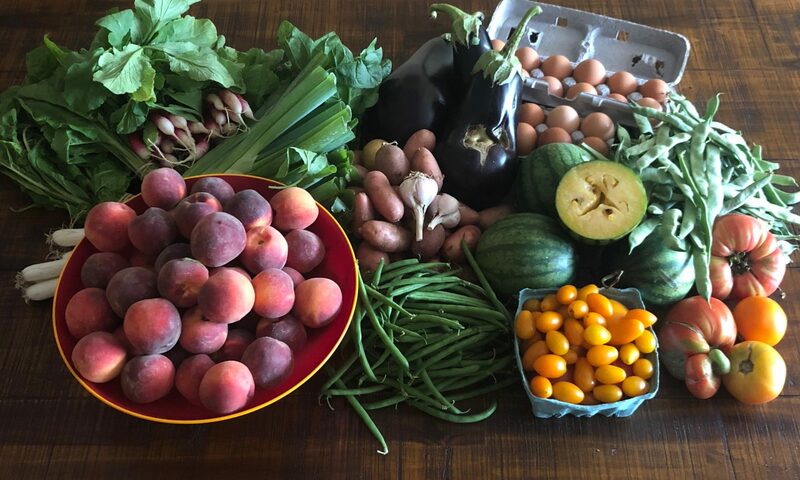 If you’ll be out of town or working late during a Tuesday distribution, you can always ask a friend, neighbor or fellow CSA member to pick up your share for you. Please make sure they know to bring a bag and which shares you get. We can’t hold shares or arrange for pick-ups outside our regular distribution window. If your share isn’t picked up by 8:15 p.m., it will be donated to a local food pantry to help Brooklyn neighbors in need! If I buy a half share of vegetables, can I still add fruit, eggs or flowers? For an idea of what to expect, check out our weekly share lists from a recent season or our weekly pics on Instagram. I signed up for a veggie-only share. Then I went to distro and saw the strawberries and flowers and felt really sad. That’s not a question, exactly, but we get it. Don’t worry, you can still add a fruit, flower, or egg share after the season has started! Email us at info@prospectparkcsa.org and we’ll help make it right. What’s organic here, and what’s not? Everything grown on Windflower Farms is organic. That means everything in your vegetable share, plus your flowers, melons, and most of your berries. Other fruits come from neighboring farms that Farmers Ted and Jan recommend, with a focus on sustainable practices, but these other producers vary in their crop management practices and are not guaranteed to all be organic. Our brown eggs come from the Davis Family Farm, where the chickens are healthy, humanely treated, shiny-feathered, vegetarian fed, and run around pecking merrily in green grass. (You can meet and pet the chickens during the farm tours if you attend the annual camp-out and celebration in August!) Information about any extras you want to order à la carte from Lewis Waite can be found at their site. Do you have suggestions for storing my veggies? Our weekly newsletter is chock full of storage tips and recipes, and we host cooking or canning demos every season. Find many of our storage tips archived here, or use the search bar to find something specific. The weekly price breakdown for a share is cheaper than the supermarket— but the pre-season lump-sum payment is OMG. How can I still get in on this CSA thing? What if can’t make my work shift? If you can’t complete a work shift you signed up for, and it is three or more weeks away, you can log back into the shift sign-up site and select an alternate date. If your shift is fewer than three weeks away and you can’t make it, it is your responsibility to find someone to fill in for you! That someone could be a friend, another member you swap with through the Google Group, even your mom—no judgment, but those bins aren’t going to unload themselves from the truck, and it has a real impact on our operation and on all our members when members no-show for work shifts. Please don’t be that person. Work your shifts or get them covered, and reach out to our work shift coordinator, Laura (lauragagnescheck@gmail.com), if you’re having trouble finding coverage. Members who don’t sign up for or complete work shift(s) will be denied CSA registration in the future. How can I communicate with the CSA? We use the Prospect Park CSA Google Group to send you weekly newsletters, event reminders, and other info. Members can also use the Google group to communicate with each other to swap shifts or pick-up weeks, arrange carpools for the farm trip, etc. After you sign up for the CSA, you’ll be sent an invitation to join the Google group. Have other questions? Drop us a line at info@prospectparkcsa.org, and one of our core group organizers will get back to you within 48 hours.